"Our first boats only carried 49 passengers, so we've come a long way," he said. Vancouver-based USA River Cruises has campaigned for years to promote the Columbia River as a cruise line venue, and on Friday the cruise agency invited local business owners and tourism leaders to view the latest ship to join the local lineup: the American Song, owned and operated by Connecticut-based American Cruise Lines. 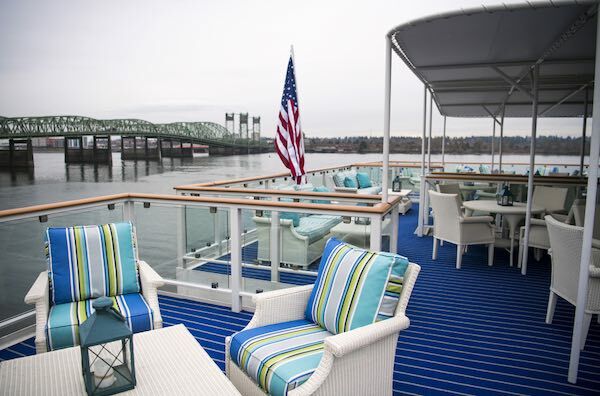 The boat docked at the Red Lion at Jantzen Beach for a tour and lunch event, and the crew led dozens of guests on tours of the interior of the four-story vessel. The American Song was built in Baltimore and debuted last fall on the Mississippi River, according to Andy Magistrale, the Northwest regional sales director for American Cruise Lines. In January, it sailed on a four-week trip down through the Panama Canal and back up to Astoria, Ore., to reach the Columbia River. The ship hasn't yet ventured upriver beyond Portland, according to Capt. Andrew Howes, because it needed to pass a U.S. Coast Guard inspection. With the inspection out of the way, the ship will soon leave Jantzen Beach on the first of many weeklong cruises up the Columbia and Snake rivers to Clarkston. "We've been training, we've been cleaning, we've been making sure it's just perfect," said Nico Suarez, one of the hotel managers at American Cruise Lines. The American Song is the third American Cruise Lines ship to operate on the Columbia River, joining the American Pride and the Queen of the West. Additional Columbia River cruise vessels, such as the American Empress, are operated by other companies, bringing the total number of Columbia River cruises to seven as of this year. The vessels range from six to 221 passengers, according to USA River Cruises. The American Song comes in near the top of that range, with a maximum capacity of 183 passengers, plus 60 to 68 crew members, according to Howes. The 328-foot-long, 55-foot-wide American Song includes 92 passenger cabins, with accessible cabins and a set of elevators near the stairs. Unlike the other two ships in American Cruise Lines' Columbia River lineup, the American Song isn't a sternwheeler -- but its interior shares the old-school riverboat aesthetic of its paddle-wheel siblings. The trip all the way to Clarkston is made possible by the ship's draft depth of only 8 1/2 feet, according to Howes. It's also equipped with a motorized prow section that lifts out of the way to make room for an extending forward ramp, allowing the boat to stop at beaches and other non-dock destinations. Magistrale began the tour by leading guests up the four-story central staircase to reach the Song's second floor, which includes a business center conference room in between two hallways of guest suites and an indoor rear lounge with views aft of the ship. The tour then went up to the third floor to visit the "back porch caf?," an outdoor lounge with a dedicated kitchen and serving window where passengers can order hot dogs and hamburgers. Most of the ship's other lounges also include bar counters and offer unlimited snacks, Magistrale said. The fourth floor features an exercise room and the main forward lounge with a drop-down screen for movies. Magistrale also took the guests up to the fifth floor: the outdoor deck that runs most of the length of the top of the boat. "This is just a viewing level only," he said -- although he noted that it does include a putt-putt golf area. The one-destination Portland-to-Clarkston cruises will depart from Jantzen Beach and sail down to Astoria, then reverse course and travel all the way up the river to Clarkston, with multiple stops at ports and attractions along the Columbia and Snake rivers, and in some cases local entertainers will come aboard for an evening or a portion of the cruise. Each cruise will also feature a guest speaker. Howes has captained cruise ships on multiple rivers, but he said the Columbia River is his favorite cruise venue due to its scenic views and wide variety of environments. "The change from the rainforest down there to the high desert up there is just incredible," he said. The tour ended with a presentation in the forward lounge followed by lunch in the dining hall back on the first floor. The hall has a 190-seat capacity, according to hotel manager Christina Hargis, and can seat the entire passenger complement at once for local-inspired cuisine. American Cruise Lines has been offering Columbia River cruises since 2011, when USA River Cruises urged American Cruise Lines owner Charles Robinson to buy the Queen of the West and restore its Columbia River operations after its previous owner went bankrupt. "Before that, he never had anything west of the Mississippi," said USA River Cruises co-owner Cindy Anderson. USA River Cruises was founded in 1996 and moved to Vancouver in 1999. The travel agency specializes in the type of small cruise ships that are typically used for river cruises, usually with a passenger capacity of fewer than 700 people. The company books passengers for more than a dozen Columbia River cruises ranging from four to 10 nights, with different destinations and themes along the Columbia and Snake rivers. Starting ticket prices range from $1,200 to $7,200, and are typically billed as all-inclusive, with onboard meals, beverages and activities all included in the price. In addition to promoting the Columbia River overall, USA River Cruises has also been placing an increasing emphasis on promoting Vancouver's Terminal 1 dock as a port of call for cruise lines. "A lot of these (cruises) go to Portland, but they don't know about us," Anderson said. The only ship that currently stops at the dock is the American Empress, which was purchased by the Tennessee-based American Queen Steamboat Co. and returned to the Columbia River in 2014 following several years of disuse. But Anderson hopes to convince additional ship operators to follow the Empress' lead by promoting downtown Vancouver and The Waterfront Vancouver as fun and walkable destinations for passengers' onshore excursions, and highlighting local events like the Vancouver Farmers Market. It would be simple for any of the existing cruise lines to add a Vancouver stop, she said, and the odds improve with each new ship that joins the Columbia River's expanding river cruise industry. "The Columbia River outsold the Mississippi River last year, for first time ever," she said. "Last year we had six ships on the river and they were all sold out, from May to October." New Cruise Ship Rollin' on the Columbia River <-- More photos at original site.